Hello my fellow plant lovers! I am personally very thankful today to have the opportunity to write to you about how your body appreciates and responds to you eating more plant-based, whole foods. It’s a subject that is near and dear to my heart, considering how many people are lost to heart disease In America every single day. By choosing more plants, you are choosing a path to a longer life with more natural energy and vitality — and you’re setting an example for those around you. Thank you! In my line of work as a Wellness Coach, I am lucky enough to see people transform, and then I get to see their family members transform as well, and then I get to hear about how their family friends and colleagues are starting to as well. I hear about them ordering Planted Table for their office, offering to cook a tofu-scramble for the family, and winning weight-loss challenges at their gym. It truly moves me to see these kinds of changes being made. People are starting to take their power back, and take the lead on creating a long, healthy life for themselves. Speaking of which, February is Heart Health Month! We are at the end of the month (that was fast!) and it is still worth shining a light on how we can best take care of our life-giving hearts, generously beating life into our bodies every moment of the day. Harvard Medical School has published several articles on the ways plant-based diets protect our hearts and provide multiple additional health benefits. 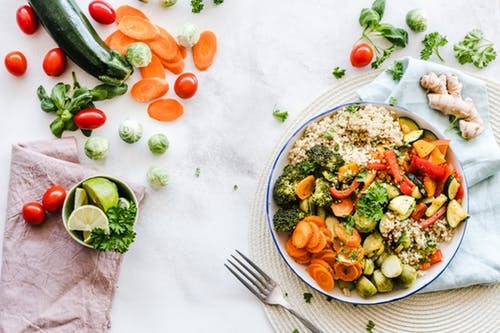 Even The American Cancer Society and the American Heart Association are now too stating that plant-based diets offer protection against coronary heart disease, metabolic syndrome, some cancers, obesity, hypertension, type-two diabetes and cardiovascular mortality. It has also been shown that eating more plants, like vegetables and (yes) fruit, and removing processed meats and packaged products (which are full of fillers, stabilizers and preservatives to extend shelf-life) can actually reverse obesity. In my opinion, it is incredible how plant-based foods are naturally packed with little gifts, overflowing with preventative medicine, without anyone having to change a thing. They give us the vitamins, minerals, fatty acids, antioxidants, and fiber we need to thrive at our full capacity. It’s a miracle! I mean that. It’s about getting back to nature. Then one notices that natural flow of energy (sometimes not right away. There can be a detox period)! Part of getting back to nature and perhaps a Level two strategy, is to also eliminate pesticides, which are meant to kill off organisms. We don’t want to ingest the foods that were bathed in chemicals (see: things we humans are meant to consume vs things we are not). The great news is that Planted Table chefs scour organic farms and farmers markets for you, and every single ingredient included in their plant-based meals is 100% organic. Can’t beat that! Are you curious about how to make a plant-based lifestyle work for you? Planted Table can handle that for you by delivering fully cooked, ready to eat, plant-based meals to your door. The best rule of thumb? I like to use Michael Pollan’s quote and keep it simple. Here’s to a living a long full of love, adventure and energy. Looking to transform your relationship with food? Click here. Looking to try Planted Table meals? Click here. My clients will receive $25 off their first order.